It’s that time of year again: Our bi-annual designer dash to the finish line. Our design dare. Our “make it beautiful or bust” 6 week challenge to totally transform a space from ugly duckling to sophisticated swan, all while documenting it online week-by-week. Is it a bit mad? Yes, indeed it is. Would I miss it for the world? Not on your life. And the best part? We’re all in it together. 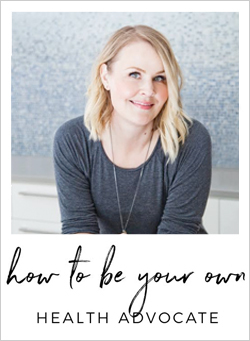 I can’t write this post without thanking Linda of Calling It Home for breathing life into this brilliant idea and for inviting me to come along for the ride the second time in a row as one of the featured 20. This will be my fourth ORC in total (the other two as a linking participant), and I imagine I’ll dive in as a linking participant again in the Spring, barring wild horses dragging me away or some such happening. As a designer, I’m always grateful for a kick in the pants to get my own house done, and the ORC is that perfect high-heeled boot to the derriére. 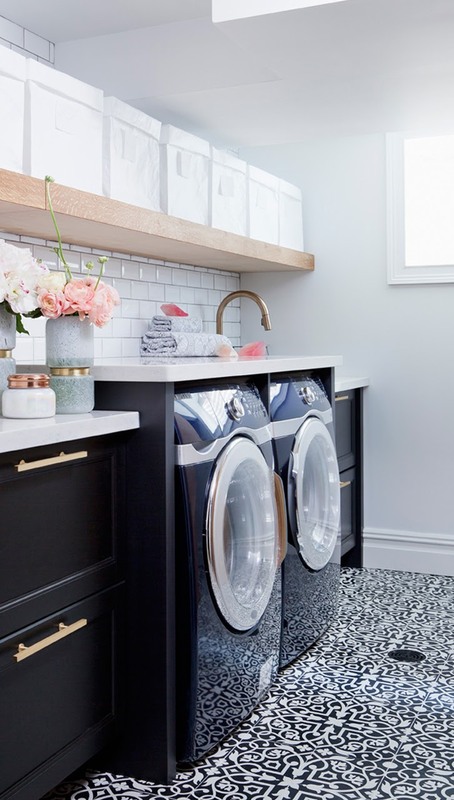 Exibit A is the first space I ever transformed for the One Room Challenge: Our Luxe Laundry Room. I still remember all the broken tapcons and other crazy challenges we faced to get it done in time, but it was soooo worth it for the finished product! 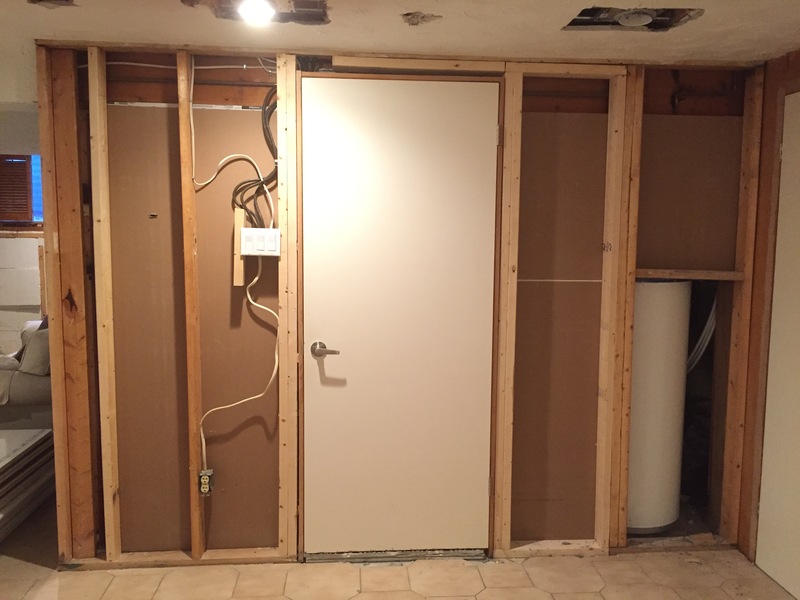 And it seems rather apropos that our laundry room is the finished portion of the level of the house that we will be working on this time around. That’s right, there’s ANOTHER level to our never-ending 1960’s side split! We joke we that bought Snoopie’s house, but this basement level really is the final frontier of untouched territory. 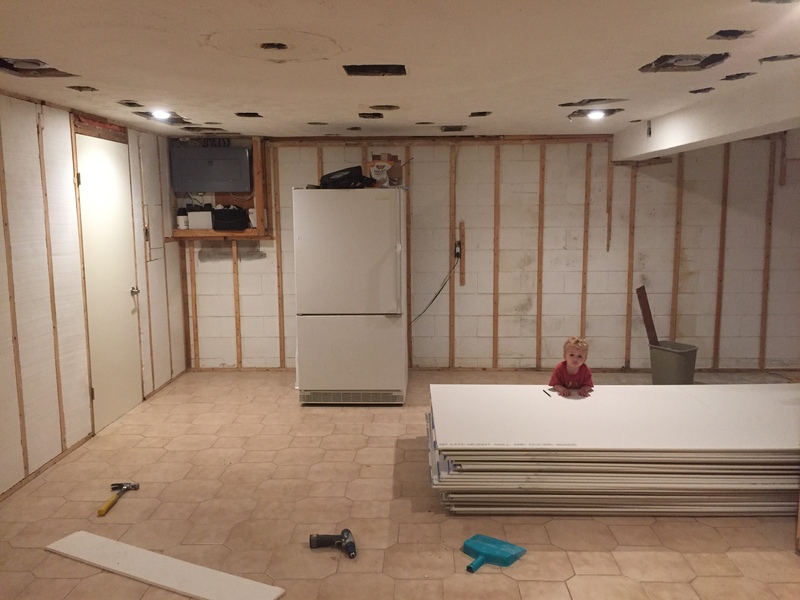 Friends, meet our ugly duckling basement. It’s a shame we don’t have the real before photos, because this basement was completely clad in brown faux wood panelling when we bought the house. With whipped meringue style plaster on the ceiling. And a bar area that would have made Austin Powers proud. I may decide to tweak the design for the panelling just a bit (or a lot), but this is our jumping off point, and I’m pretty dang excited about it. I don’t have a mood board for the exercise room, mainly because it will be quite simple…BUT…there will be one seriously juicy surprise in that room that I’ll be sharing with you in the weeks to come thanks to my friends at LG. And in the meantime, can we just gush over that ridiculously perfect, Hollywood Deco glam sofa from Whittington & Co? As you know, beautifully made upholstery is a designer love language for me, and the Joni sofa from the Industrial Storm for Whittington collection had me at hello. Her lines are perfect, her proportions generous enough to seat all four of us for cozy movie nights at 96″ wide, her construction the gold standard in the industry (kiln-dried hardwood frame, 8-way hand-tied coiling), and her down and feather blend bench seat is basically a cloud sent from heaven to cradle our tushies with happiness. You think I overstate it. I do not. And you may think I’m crazy to upholster her in white, but just you wait until I tell you about the brilliance that is our fabric from Thibaut. There are so many other treasures to look forward to in this space, and I can’t wait to share them with you in the 5 weeks ahead! There will be some serious DIY cabinetry happening, the aforementioned panelling which will get some serious Metrie magic, a boatload of painting (all in Farrow & Ball, natch) and some very fun decorative details that when pulled together should take this space from cold and uninviting to cozy and sophisticated. What’s on my must-have list for this space? Loads of storage, functionality and comfort, and a serious serving of style. Hopefully we will meet all those markers and then some by the end of this adventure! 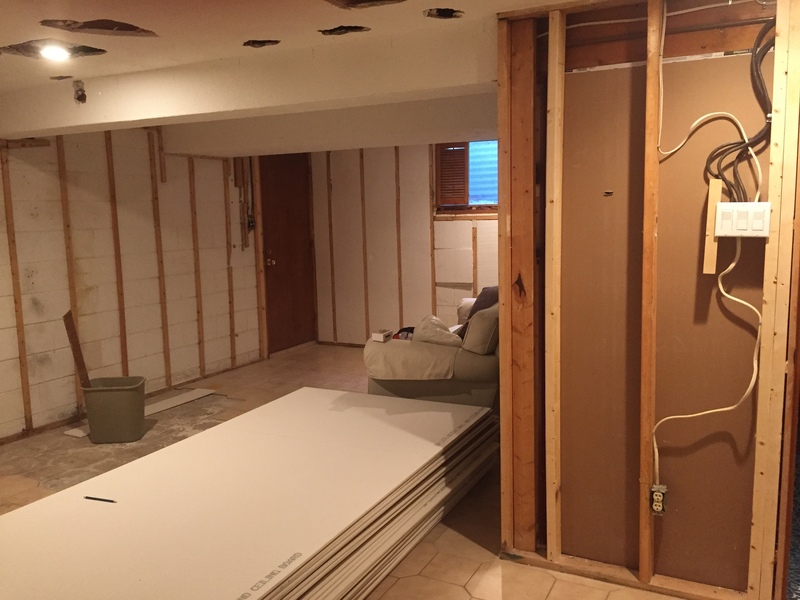 For now, it’s drywall and electrical and figuring out exactly how to hide that oh-so-incoveniently located electrical panel. Wish us luck, and then head over to see what my 19 fabulous ORC comrades have planned for their One Room Challenge spaces! The list of featured participants for this round is STELLAR, and you do not want to miss a single detail, my friends! I know this will be a swanky space so I am definitely looking forward to following along! Your moodboard is divine! I cannot wait to see the final reveal! That sofa is a-maz-ing! I look forward to following along & see this space come to life. Sarah, this is going to be beautiful! Can’t wait to follow along with all your work! So exciting, Sarah! And so honored to be participating in this with you. 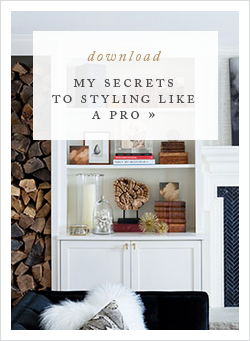 We must be style sisters, because that Bernhardt chair was on my short list for my ORC makeover, too! Cannot wait to see what you do! Girl! You’re laundry room is by far still one of my favorite ORC spaces! Can’t wait to see what you do this year! Wow! This is a serious undertaking! I have so loved your past ORC’s and I can wait to see the magic you pull off in this space. I love everything you’ve got planned! Everything you touch is perfection and this will no doubt be the same, friend! 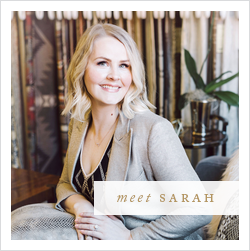 so excited to follow along and see our basement transformation Sarah! That sofa is so dreamy and yes I was going to say, your before basement doesn’t look too bad and it’s all open and ready for its makeover! I did decide to brave the challenge and linked up my kitchen facelift. I better read up your survival guide! Wish me luck! Whoa, this is a huge undertaking. I’ll bet on you, every time. Hope all your plans go well. I know it will be stunning.